…opening doors to healthier and more affordable homes! On the third day of Christmas my green friend gave to me…3 large rain-barrels, 2 new thermostats…and a live…Christmas tree! I consider rainwater harvesting or catchment to be one of the more important green features of a home. With our water supply becoming less abundant and less safe it is up to us to conserve and reuse as much water as possible, especially for landscaping needs. There are a couple factors to consider when deciding on the type of rainwater harvesting you need. First, you should consider your current landscaping and decide if you would prefer to redesign your landscaping to reduce the amount of necessary irrigation or, second, would you prefer to keep your current landscaping and match the needs to the type of rainwater harvesting device you should install. 1. Redesign? Do you have a yard full of thirsty grass and plants that might not be native and require frequent watering? Most counties have imposed watering restrictions which will only become more restrictive as our water sources diminish. You can become proactive by redesigning your landscaping with more native plants and beds and less lawn turf. Using the 8 principles of Florida Friendly Landscaping (FFL) you will end up with a beautiful yard that incorporates “right plant, right place” and drought tolerant plants. If you live in a community with an HOA you might want to read one of my posts about the Florida Statutes that allow you to plant a water-conserving landscape and HOAs. 2. How much and what type of rainwater catchment system do you need? If you already have incorporated drought tolerant plants into your landscape you might have minimal needs for watering and four or five rain-barrels at your downspouts might be enough. You can always start with one or two and add more as you find necessary. 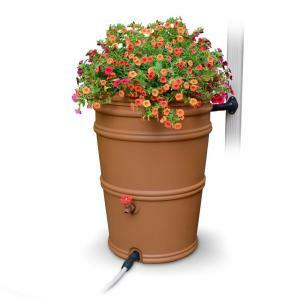 Click here for instructions to make an inexpensive and easy double rain-barrel system yourself. Should you decide to keep your landscaping that requires larger amounts of irrigation it would behoove you to begin looking into a cistern type system of rainwater harvesting. Many cities that are already experiencing lower water supplies are encouraging residents to install cisterns. For more information about calculating the size of a cistern the University of Florida offers a great article about cisterns. Sign up and learn more! …on the twelfth day of Christmas my green friend gave to me…twelve native shrubs, eleven solar shades, ten wax wraps, nine tubes of caulk, eight cotton socks, seven false roselle, six craft beers, five mutual shares, four smart bulbs, three bags of taters, two quarts of milk and a potted cypress tree! …on the eleventh day of Christmas my green friend gave to me…eleven solar shades, ten wax wraps, nine tubes of caulk, eight cotton socks, seven false roselle, six craft beers, five mutual shares, four smart bulbs, three bags of taters, two quarts of milk and a potted cypress tree! …on the tenth day of Christmas my green friend gave to me…ten wax wraps, nine tubes of caulk, eight cotton socks, seven false roselle, six craft beers, five mutual shares, four smart bulbs, three bags of taters, two quarts of milk and a potted cypress tree! …on the ninth day of Christmas my green friend gave to me…nine tubes of caulk, eight cotton socks, seven false roselle, six craft beers, five mutual shares, four smart bulbs, three bags of taters, two quarts of milk and a potted cypress tree! Locate a natural spring for drinking water near you.